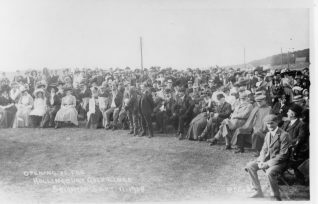 The opening 'drive in' J H Taylor is characteristically seated in the centre of the crowd. 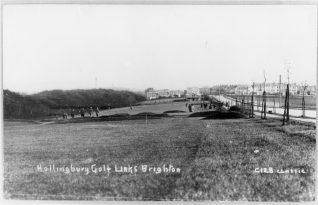 View down the golf course towards the new pavilion - This picture looks to have been taken on a Sunday when there was no golf judging by the attire of the walkers on the course. 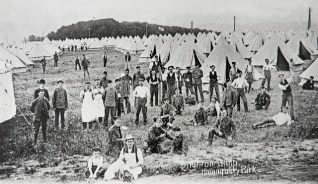 It was not long before there was renewed controversy when it became clear that a tee and green were being built inside the Hillfort in contravention of a covenant placed on the land! 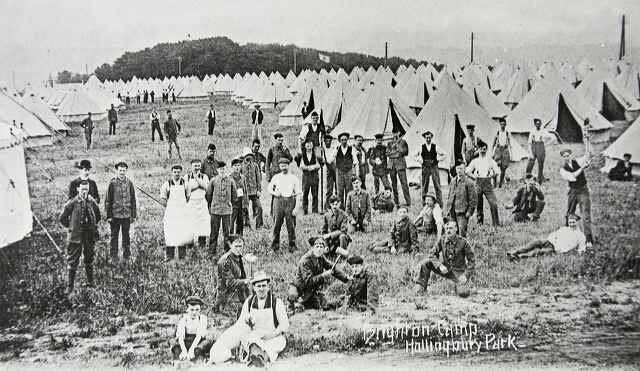 This sparked off a series of letters to the local press protests in Council and the Ratepayers Association held a protest meeting at a local school. 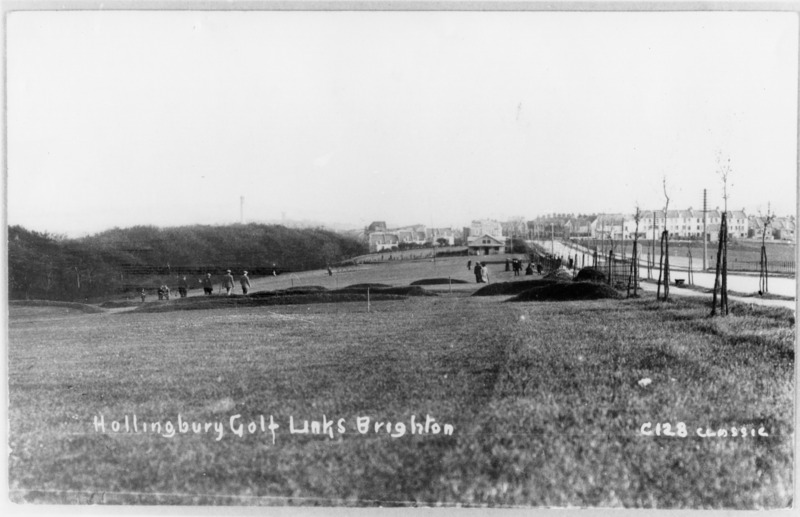 The meeting ended in a shambles of “great excitement and uproar” according to the Brighton Herald and their opinion was that the resolution to remove the tee & green was not carried. Work carried on unhindered and apace. 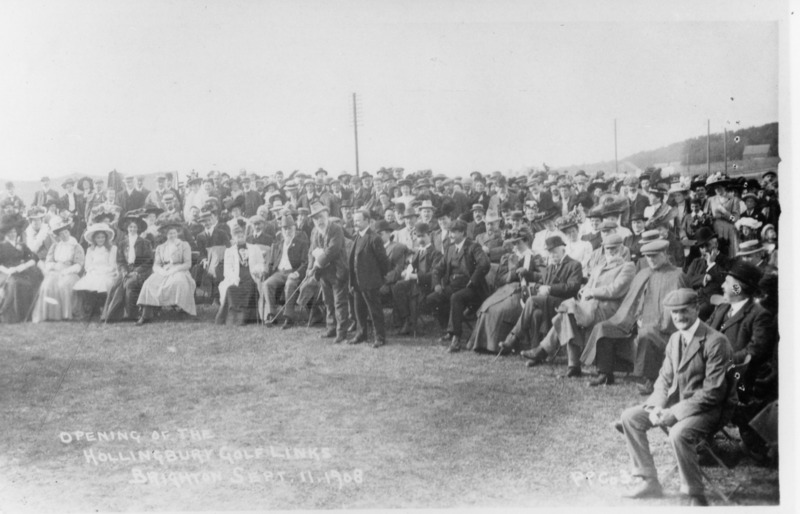 The Course & Golf Pavilion were completed in a remarkably short time ready for the opening ‘drive in’ by the Mayor, Alderman J.P. Slingsby-Roberts, at the formal opening on the 11th of October 1908.- he played the opening drive with “a handsome implement” made by the newly appointed professional (J H Torrance) before a large gathering. 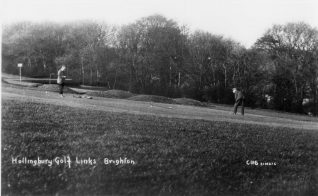 This was followed by an exhibition match between the local professional and the professional from Lewes Golf Club, F E Penfold. 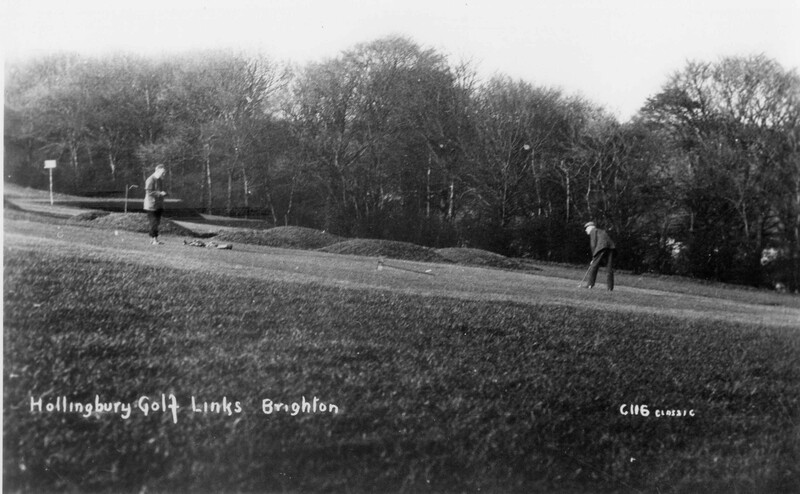 The rural nature of the golf course can be gauged by reports in the Parks (Golf links) Sub Committee minute book (DB/B22/1) available at The Keep. DB/B22/1 57/58 – Minuted that the shepherd in charge of the sheep which graze on the links had been of great assistance in keeping the course in good condition – paid a gratuity of 10 shillings by the Steward. A report that the owner of the rabbit warren adjoining the links had complained that players and caddies are breaking down his wire fences searching for lost balls.